I'm excited to have been invited to be a presenter for the 2016 SCGS Jamboree Extension Series Webinars. You can learn more about the webinars from the press release below. Sign up for the webinars you are interested in now. It's FREE! I will be presenting Once Upon a Time at an Antique Store: Telling the Story of Mrs. E.G. Stetson on Saturday May 7th. You can register for this presentation here. 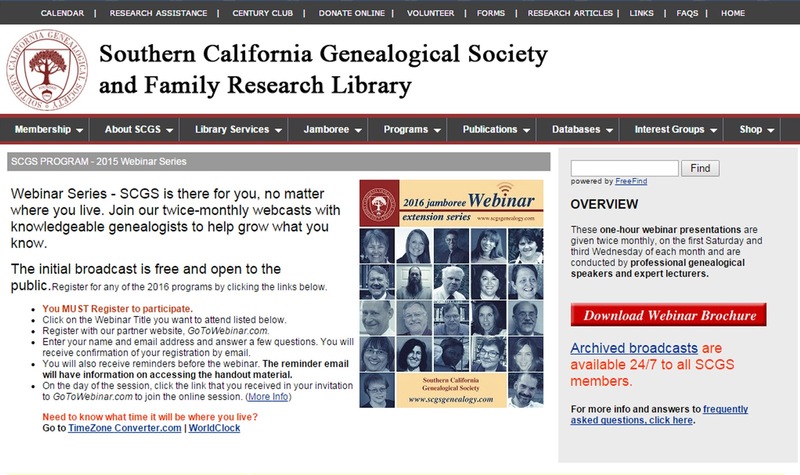 The Southern California Genealogical Society is proud to announce the 2016 schedule for the highly acclaimed, free Jamboree Extension Series Webinar program. 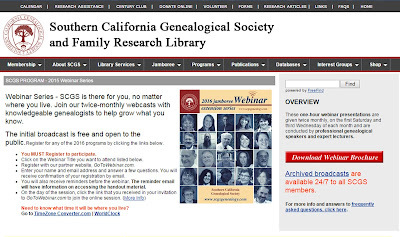 SCGS offers an international online audience of genealogists and family historians educational webinars twice a month. The 2016 series begins Saturday, January 2nd at 10:00 a.m. PST. This year's speakers include Thomas W. Jones, Ph.D., CG, CGL, FASG, FUGA, FNGS; Diahan Southard; Gena Philibert-Ortega; Jean Wilcox Hibben, Ph.D., MA, CG; Dr. Michael Lacopo; Cyndi Ingle and many others presenting on a broad range of topics. Whether you are a budding genealogist or a seasoned professional, the webinars offer a wide range of topics to build your skills. The Jamboree Extension Series has helped to fulfill the SCGS mission to "foster interest in family history and genealogy, preserve genealogical materials, and provide instruction in accepted and effective research techniques" since its inception in 2011. All SCGS webinars are open to the public and free to attend. Webinars are offered the first Saturday (10:00 a.m. Pacific time) and third Wednesday (6:00 p.m. Pacific time) of each month. Sign up (remember - it's FREE) by going to the SCGS website page with the 2016 Webinar Series information, http://tinyurl.com/2016-SCGS-Webinars. Click on the links to register for as many webinars as you'd like. A confirmation email will be sent, along with the link to attend the webinar. You can attend the webinars on your computer, or smartphone. If you don't have an internet connection, you can even dial in by phone and listen to the session. SCGS members never need to worry about missing a webinar. As a benefit of membership, SCGS members enjoy access to over 130 archived webinars and select Jamboree sessions to view at their convenience 24/7 on the SCGS website behind the member wall. Visit our membership web page for more information on this and other valuable membership benefits. <http://www.scgsgenealogy.com/webinar/media/2016webinar-handout.pdf>and share it with family, friends and neighbors today. Join us for our first session on Saturday, January 2, 2016!